Happy anniversary everybody! Yes, I started this very blog nine years ago this week, and to celebrate this auspicious occasion we have another disc that was suggested by a long-time WWR follower. Donated to our aural cabinet of curiosities by Steve Simms-Luddington, information on the utterly bizarre promo record I Want a Lovely, Lovely Sausage has been hard to come by, but I have managed to piece together a few facts about it and its creator, Alexander Silver. 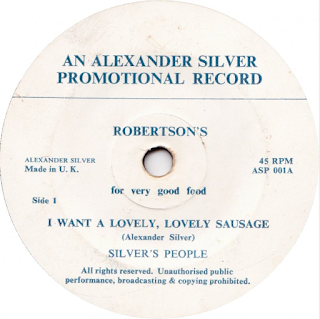 Written to promote a prize-winning British butcher, rather than the more famous jam manufacturer, I Want a Lovely, Lovely Sausage and the equally peculiar flip side, Come to Robertson’s was issued some time in the early 70s on the custom Alexander Silver Promotional Records label, written by the same Alexander Silver and performed by Silver’s People – presumably Alex on vocals and the horrendously out of tune guitar, plus two unwilling and under-rehearsed friends on bass and drums. Alex Silver was a jobbing songwriter who had previously written the England Football Song in 1965, issued as a single-sided single by the small Jackson Recording Company, a custom recording company who also put out the occasional 45 or LP and that was based in Rickmansworth, Hertfordshire. Issued primarily to help bolster England’s chances in the 1966 World Cup (well, it certainly worked! ), the song was a hit with Sir Alf Ramsay, was played at the World Cup opening ceremony and at several matches during the competition, and could be heard on television and on radio prior to and during the tournament. Our Alex also wrote an alternative version of the official World Cup Willie theme, but this seems not to have been recorded. Buoyed by the success of this, Mr. Silver set up his own company. 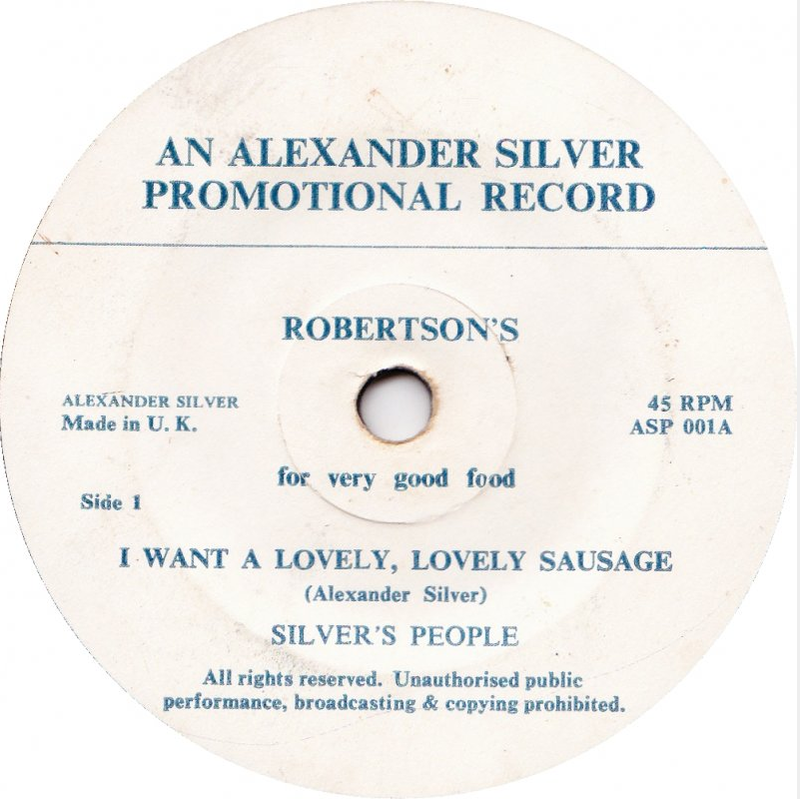 As well as I Want a Lovely, Lovely Sausage his Alexander Silver label issued at least one more 45, the David Kaye Sound’s Lorelei backed with Sing An Alexander Silver Song… both songs, naturally, written by Alexander Silver. There have been a number of British butchers trading under the name Robertson over the years, and there’s no clue on the label or in the lyrics as to which particular company the disc was cut for. The names of some of the staff are mentioned in the lyrics of the b-side… time for someone to do some detective work. Released on the tiny Lorida label, this disc was custom pressed by RCA in 1958 – just about the same time that they were pressing discs for Grace Pauline Chew’s Musicart label. Lorida isn’t a spelling mistake: it’s the name of a small, unincorporated community in eastern Highlands County, Florida. Originally named Istokpoga (a Seminole Indian word meaning ‘drowned man’), the name was changed to Lorida (pronounced lo-reed-a) by then-postmistress Mary Stokes 1937 by simply lopping the ‘f’ off Florida. Credited to Leona Bass and The Lost Guitars, the amazingly inept I Want to Marry an Egghead appeared as the b-side to Ralph Trullo and The Lost Guitars’ My Heart's With You on Trial. The lyrics to both sides were written by Martin Manders, with René Bruneau providing the music (if you can call it that) to I Want to Marry an Egghead, and Phoebe Cole composing the music for My Heart's With You on Trial. Both songs were published by Fighter Music Publishing Limited in June 1958. Bruneau was an old hand (literally: he was born in 1900), and wrote the music to dozens of copyrighted songs, many of them with lyrics written by one Ed Kukkee (full name Edwin Waldemar Kukkee), including What Happens When a Bug Goes Bugs, Papa Stork is Paying Us a Visit and The Wiggle Wiggle Rag (I wonder if Bob Dylan was aware of that one?). Cole too had form, previously composing the music to the songs Kiss me, Sweet and Kiss me All the Time (both 1957). My assumption is that Mr. Manders sent his lyrics in to song poem-esque services to have them set to music: this is borne out by the fact that all of Cole’s and Bruneau’s co-writers retained copyright in their respective compositions. 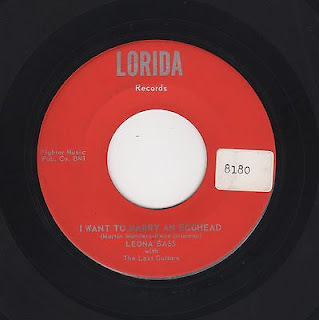 Other people associated with Lorida also had connections with the song-poem world: Earl Luton (of Lutone fame) composed at least one side for Lorida, and Harold Crosby - who also issued a 45 on Top Fifty - issued a brace of 45s on Lorida. Mike Sarlo, who performed with a band called the Footstompers on another Lorida release, was a programme director for a Pennsylvania radio station who also dabbled occasionally in songwriting and recording. It appears that Manders (1906-1978) was from Allouez village, Green Bay, Wisconsin – quite a way from Florida. It appears too that Lorida issued at least a half dozen 45s during the life of the company, and that this particular coupling was the first. Quite how it came about is a mystery: I assume either Leona or her dad paid for the recording and pressing themselves, or that the Bass family were friends of Martin Manders and he stumped up the $50 or so to have the record cut and pressed. UPDATE APRIL 2018: friend Bob has tracked down the a-side, Ralph Trullo doing his best Elvis impersonation (and failing miserably) on My Heart's With You on Trial. I have not discovered any further recordings (yet) by Mr. Trullo, but it is my belief that his surname has been Anglicised from Trujillo, a reasonably common name south of the border. Most of you will already be acquainted with Leona Anderson: I’ve written about her a couple of times before but it’s always nice to revisit old friends, especially if you have something new to share. And boy, do I. Today I present for you the missing Leona Anderson 45, her second for Columbia and her third release at that point, Limburger Lover/Yo-Ho the Crow. Let’s have a quick recap of her story (if you want more, there’s a chapter on Leona’s career in my first book: most of what follows is culled from there). Born Leona Aronson on April 3, 1885, Leona was the younger sister of early cowboy movie star Gilbert ‘Broncho Billy’ Anderson. She began her showbiz career at fifteen and seriously thought about a career as an operatic singer (I’ve read that her brother paid for her to travel to London to study) before appearing in a number of films - thankfully all silent – including Mud and Sand (which starred Stan Laurel as Rhubarb Vaseline) and In the Park which starred Charlie Chaplin. Unsurprisingly she also appeared in several movies directed by and starring her brother. Many years later (in 1959 to be exact) she appeared in the Vincent Price horror film The House on Haunted Hill as the demonic Mrs Slydes. By the mid-1950s Leona had developed her unique singing style and made many cabaret appearances sending up opera singers: she once said she chose this career because ‘Opera singers just can't kid themselves properly; they never can let their voices go’, which is not a criticism that you could ever level at her. Throughout her career she would wilfully let her voice go just about anywhere it damn well pleased. 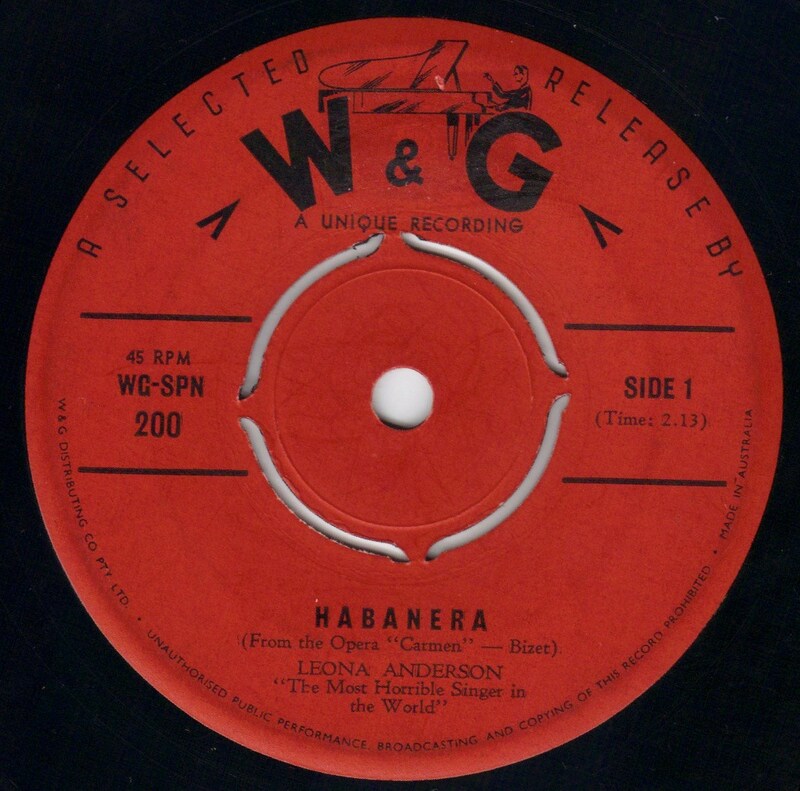 Described by Billboard as ‘a gal with cultivated, and broken, pipes’, Leona (erroneously credited as Leonna Anderson) issued her first waxing, Fish, on both 78 and on clear red vinyl 7”, in 1953. Fish was released by Horrible Records (motto: if it’s really a Horrible Record it’s bound to be a hit) and put out as the B-side to the Dr Demento favourite There's A New Sound (The Sound Of Worms Eating Your Brain) by Tony Burrello. Fish was co-written by Burrello, who also played calliope on the track; Bill Baird (a puppeteer who would become better known a decade later for the Lonely Goatherd marionette scene in The Sound of Music) played tuba. 500 copies were originally pressed but within two weeks Horrible Records had received orders for a further 100,000 copies. TV comic Ernie Kovacs heard it and invited her on his show. Aided by Burrello and Murray Leona put together a nightclub act, which she called Songs to Forget; the success of the act, coupled with Kovacs championing her cause led to her recording a cover of the Pattie Page hit The Mama Doll Song (backed with I’m A Fool To Care) for Columbia (featured on this blog before) – of which Billboard wrote ‘her cracked tones, sadly out of tune (have) the same macabre appeal as the miserable chirping of Florence Foster Jenkins’. Issued in March 1955, more than 18 months before her seminal album Music to Suffer By, her second (and last) 45 for Columbia – and the one I present for you today - featured Limburger Lover and Yo-Ho the Crow. Both songs also appeared, in re-recorded form, on the album. Catalogue info exists for 78 rpm versions of both Columbia singles although, as is often the case with these things, there appear to be more promotional copies of the 45 in circulation that retail copies. A fourth single, Indian Love Call/Habanera, was also issued, in March 1956 as both a 78 and 45 by Unique (it was also issued, with the sides flipped, in Australia: I’m lucky enough to have picked up a copy recently for my own collection). She also recorded a theme tune, of sorts, for the Bob and Ray radio show in March 1956. She died, on Christmas Day 1973, in a retirement home in Fremont, Alameda County, California at the age of 88. She may be gone, but she left us with a legacy for which we should be forever grateful. A copy of this 45 recently turned up on Ebay: I was bidding for it but dropped out at $30. I’ll console myself with the MP3s until the next one turns up. On September 28 this blog will celebrate its ninth anniversary: yes, I’ve been writing about bad music for that long. To celebrate, I asked readers (via our Facebook page) to nominate a favourite bad record that I had not written about, and over the next few weeks I’m going to share some of those suggestions with you. You can suggest your own via the comments section at the end of this post. Knighted in 1968, during the 30s and 40s Sir Robert was one of British ballet's premier male dancers. Noted as ‘a dancer who could act and an actor who could dance’, his personality and talent played a vital part in building the fledgling British ballet. After studying briefly with Anna Pavlova in Melbourne (which had been arranged by his rather dour father), Robert went to London in 1933 to study and perform with the Sadler's Wells Ballet, now known as the Royal Ballet. He was the leading male star with that company from 1934 until his resignation in 1950, frequently appearing with his longtime partner Dame Margot. In the 1937-38 season, he beat Laurence Olivier for the part of Oberon in A Midsummer Night's Dream at the Old Vic, playing opposite Vivien Leigh. He later repeated that role opposite Moira Shearer at the Metropolitan Opera House and on a US tour in 1954. During his years with Sadler's Wells, Sir Robert took occasional leaves of absence to act, most notably in the classic Michael Powell and Emeric Pressburger film The Red Shoes, a stylish, highly influential movie about backstage life in the ballet. Years later, when an interviewer asked him whether the high-pitched portrayal of the events and lives of the dancers were exaggerated, he replied, ‘Oh, no, dear boy, it was quite understated’. Other film credits included multiple roles in the Tales of Hoffmann, the Bishop of Ely in Olivier’s Henry V and the terrifying Child Catcher in the classic Chitty Chitty Bang Bang. In 1995 Marylin Manson paid tribute, of sorts, via the album Smells Like Children, with Manson dressed as the Child Catcher on the sleeve. During his career he Puccini's La Boheme and Rimsky-Korsakov's Coq d'Or for the Royal Opera House, Covent Garden, T. S. Eliot's Murder in the Cathedral for the Old Vic and directed the musical Camelot on stage. In 1955 he co-starred with Katharine Hepburn, touing in three Shakespearean plays in Australia, and from 1965 to 1975 he was co-director of the Australian Ballet. But here’s one thing you’ll struggle to find a mention of in his official biography. 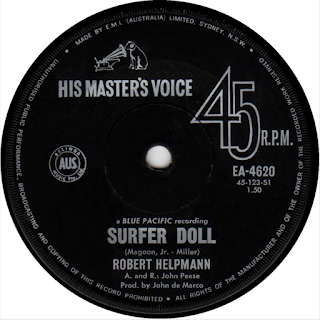 In 1963 Helpmann recorded four surf-themed tracks for HMV in Australia. Seriously. Someone at HMV thought the gay, 54 year-old Helpmann could pass as a teen idol and ride on the coat tails of the Beach Boys, Jan and Dean and the like in to the charts. Two cuts from the session were issued as a 45 the following year (the same year he was appointed CBE) - Surfer Doll and I Still Could Care (HMV EA-4620) - with the second pair - Surf Dance and Let-A-Go Your Heart - issued the following year (EA-4665). All four tracks were collected on the Raven EP Sir Robert Helpmann Goes Surfing in 1982, dubbed from vinyl copies as the master tapes could not be located. There’s a hysterical film clip of Helpmann performing Surfer Doll on YouTube if you care to look for it and, apparently, sheet music featuring Robert on the cover in a peroxide blond wig. The first 45 was also issued in the US, on Blue Pacific Records. Helpmann died in Sydney – appropriately for this anniversary post on September 28 – in 1986 after a long battle with emphysema, caused it seems by a lifetime of heavy smoking. He was 77 years old. With enormous thanks to Graham Graham for bringing these tracks to my attention, here are all four sides cut by Sir Robert for HMV Australia. A couple of weeks ago I introduced you to the delights of Tommy Dee, the stentorial DJ who cut more than a dozen ridiculous records for various labels during his career, several of which dealt with the deaths of musicians. Well, thanks to popular demand, we’re revisiting Tommy today, specifically to have a look at another of his specialities, the patriotic pop song. 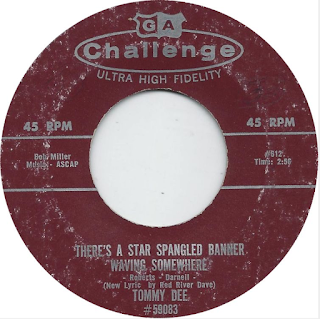 There’s a Star Spangled Banner Waving Somewhere/The Hobo and the Puppy (Challenge 612) was issued on 1960, just a year after Tommy’s only hit, Three Stars. There’s a Star Spangled Banner Waving Somewhere tells the story of Francis Gary Powers – usually referred to as Gary Powers –an American pilot who was shot down while flying a U-2 spy plane for the CIA in Soviet Union airspace. The former USAF U-2 was equipped with a state-of-the-art camera designed to take high-resolution photos from the edge of the stratosphere over hostile countries, including the Soviet Union; Power’s mission was to photograph military installations and other important sites. He was shot down by a surface-to-air missile over Sverdlovsk. Powers was captured and taken to Lubyanka Prison in Moscow. When the U.S. government learned of Powers' disappearance they issued a cover statement claiming a ‘weather plane’ had strayed off course after its pilot had ‘difficulties with his oxygen equipment’. CIA officials did not know that the plane crashed almost fully intact, and the Soviets recovered its equipment. Powers was interrogated extensively by the KGB for months before he made a confession and a public apology for his part in espionage. His trial began on August 17 1960, before the military division of the Supreme Court of the USSR. Members of his family were present, as were attorneys provided by the CIA. Two days later Powers was convicted of espionage and sentenced to ten years confinement, three in prison, the remainder in a labour camp. On February 10 1962, Powers was exchanged, along with American student Frederic Pryor, in a well-publicised spy swap at the Glienicke Bridge in Berlin. The exchange was for Soviet KGB Colonel Vilyam Fisher, known as Rudolf Abel, who had been caught by the FBI and tried and jailed for espionage. Powers died in August 1977. He had been working as a helicopter traffic pilot reporter for KNBC News Channel 4 when he was forced to make an emergency landing as the helicopter was running out of fuel. As he descended he noticed children playing in the area, and directed the helicopter elsewhere to avoid landing on them. If not for the last-second deviation he might have landed safely. The ‘copter crashed and Powers died instantly. Our next disc was released by Tommy in February 1967. Roger, Ed And Gus (America's Astronaut Heroes) is a tribute to the astronauts Gus Grissom, Ed White and Roger Chaffee, who had been killed during testing for the Apollo 1 mission at Cape Kennedy, Florida. The men died after fire swept through the spacecraft, designed for a manned flight to the Moon. It was thought an electrical spark started in the area holding oxygen supplies and other support systems which quickly spread in the oxygen-filled atmosphere of the capsule, killing the crew within seconds. The autopsy report confirmed that the primary cause of death for all three astronauts was cardiac arrest caused by high concentrations of carbon monoxide. The third degree burns suffered by the crew were not believed to be major factors, and it was concluded that most of those had occurred postmortem. Asphyxiation happened after the fire melted the astronauts' suits and oxygen tubes, exposing them to the lethal atmosphere of the cabin. An Apollo 1 mission patch was left on the Moon's surface by Apollo 11 crew members Neil Armstrong and Buzz Aldrin, and the Apollo 15 mission left a tiny memorial statue, Fallen Astronaut, on the surface of the Moon along with a plaque containing the names of the Apollo 1 astronauts. Blimey, our Tommy sure knew how to pick ‘em! I have also included the B-side, School For Fools, a rarity in as much as (instead of simply narrating) Tommy attempts to sing, affecting a not unpleasant Johnny Cash-like lilt.